I. S. Kulikov outstanding Russian portraitist. He painted not just portraits, but filled the characters with originality. The artist was interested in culture and folklore, which could not but reflect on his work. 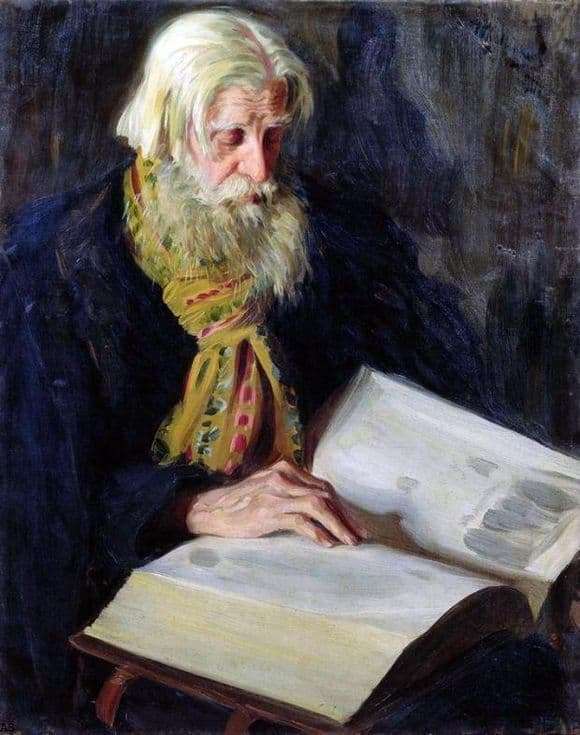 The portrait “The Old Man Reading” has another name: “The Portrait of the Old Believer”. Cloth one of the most famous. The painting depicts an old man with a long beard and casually scattered hair. For the beginning of the twentieth century, this appearance was unusual. This is an Old Believer, by tradition, people with such a worldview look like this. He focuses on reading, his gaze is directed to the book, and his fingers firmly hold the pages. The book is impressive in size, which indicates its rarity. At that time, books were a luxury, not everyone could afford to buy such an impressive edition. The books of the Old Believers belonged to the community or were inherited. Most likely, this book is religious. Concentration says that the old man reads the text, filled with deep meaning. Warm clothing says that it is winter outside. And reading itself took place more often in winter evenings, because in summer there is a lot of work and not enough time. There is a scarf tied around the man’s neck, which is embroidered in folk style. Such elements of clothing were characteristic of the artist. In his works often Russian painted scarves and elements of folk costume. This element demonstrates the originality of the elder. The picture is made in dark colors, which indicates the seriousness of the lessons of the old man. Perhaps the mood of the artist influenced the choice of colors. From the work breathes concentration. The artist very accurately conveyed the character of the old man, his enthusiasm and seriousness. Such people are the custodians of the traditions of the people, they pass from generation to generation invaluable experience. This is how identity is preserved and a new history of a successful state is written on the basis of old traditions.